Bought for my daughter's bedroom with a recent redecoration in blush and gold. The pile is nice, short but dense, and very soft on bare feet. The color works well for me, but from one direction is very pale and seems to have a bit of a sheen to it; from the opposite side/angle, it is darker (mauvey-brown almost)...which I find an interesting feature, and since its in a bedroom with one doorway to approach it, I only need to turn the rug to get the hue I prefer. But it could be an issue (or a bonus) for others thus I gave it 4 stars instead of 5. It is surprisingly more flexible than I expected - does not have a stiff backing at all...but this is not to say it doesn't seem durable and well-made. Time will tell. I have it on a hardwood floor, and do not have a skid-proof pad under it thus far. It hasn't slid around at all. I'm very happy with it - would definitely recommend. 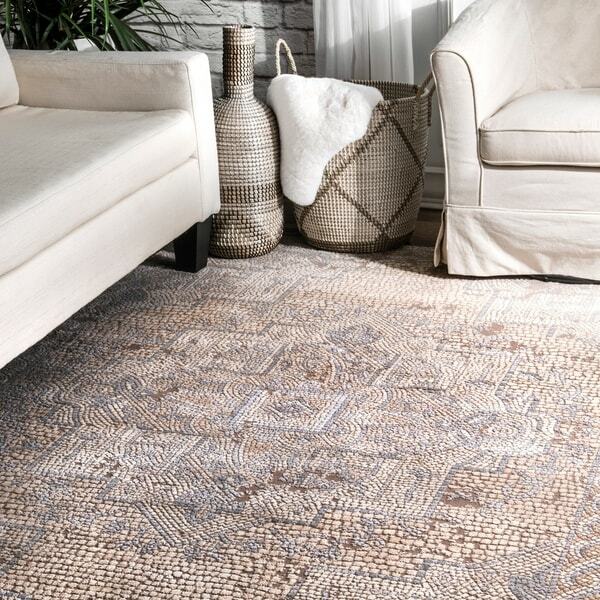 This transitional style rug with contemporary traditional dotting pattern, its beautiful mix of colors will accentuate any fashion-forward space. Power-loomed of high-twist polyester & polyester yarns, these abstract modern rugs are designed for high style, performance and easy care. Option: Beige - 8' x 10'3"
I bought this to go in my tv room that is open to the kitchen. Love the muted colors and it's interesting that it's mosaic looking. We have dark brown leather furniture and this rug helped make the room brighter. Option: Beige - 9' 3" x 12' 3"
I will be returning. The rug does not appear to be the same as the photo. The colors and design are different, slight, but definitely different. The quality is not what I was expecting. I was hoping it was a little more silky and the weave was a tighter pile. 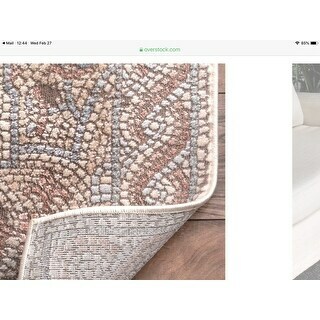 The first photo is the vendor, the second is the actual rug delivered today. My photo looks a little better than I think it does in person. 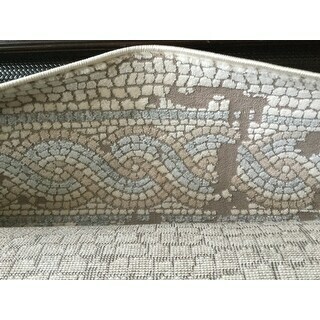 Option: Ivory - 8' x 10'3"
Traditional Brown/ Multi Medallion Distressed Rug - 5'3" x 7'8"